I replied back with, “You’re not the only one,” considering I haven’t been as consistent on my blog as I usually am. But then she said she had to write an important report and couldn’t even get that done. So my suggestion was to start with a list. Just bullet points. Incomplete sentences. Grammarless English. Or Sheng. Personally, I’m a huge fan of lists. Whether you’re trying to break out of writer’s block or a prolonged procrastination period, lists usually do the trick because they’re so simple. My personal favorite list is one I saw spreading on social media. It fools you into thinking you’re so productive. Joking aside, there’s no rule of where to write your list or how it should look like. You may write it on a post-it note and stick it on your laptop screen to increase its visibility (though that doesn’t always work because your mind gets trained to ignore it). However, the single best advice I’ve heard about daily to-do lists is “Limit your to-do list to three tasks.” No less, no more. 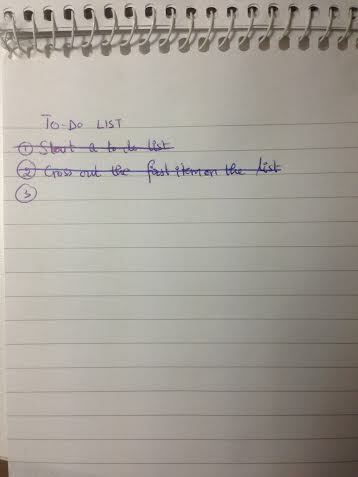 Having more than three items on your list can be a bit overwhelming especially when the tasks take hours. Also, finishing the day without crossing out everything on the list makes your mind think it’s okay to put off today’s work until tomorrow and that enables the procrastinator in you. So what type of lists are you used to writing? Leave your comments below and feel free to share. This entry was posted in blog, Life Lessons, Mind and tagged list, Procrastination, productivity, Success, to-do. Am usually not so good with lists; i have on integrated on my Windows 8 and i can’t even remember the last time i cancelled it out. About your friend losing her writing Mojo, i have a book called “discovering the writer within” by Barry Lane and Bruce Ballenger. it’s an awesome read for any writer. thanks for the recommendation. Have a good day!